Founded in 1987, Great Lakes Brewery is Toronto’s oldest craft brewery. "Our seasonal ale is now available for a limited time. Brewed with a generous amount of hops, a touch of honey, and heaps of fresh oranges. This golden ale boasts a zesty, fruity and refreshing taste. Perfectly balanced to compliment grilled chicken, seafood and salads." "Handcrafted with five specialty malts and five varieties of hops, along with just a touch of honey, we added heaps of fresh oranges and peels into the boil. A little different, you say? We sure hope so." Pours frothy like a wheat beer (you'll be hearing a lot of wheat comparisons), and cascades nicely throughout the glass. I got a 3 finger head, probably my fault, that stayed almost for the duration. It was nice and fluffy though. Colour is light amber, and it might be my imagination but I detected a definite orange like tint along the lines of an orange popsicle. There is some nice persistent carbonation that looks refreshing. The nose is fresh with mild orange flesh notes, as well as some bitter peel aromas. The sweetness and citrus notes develop a bit throughout the glass, but they weren't as strong as I had hoped. Lots of carbonation, medium bodied and fills your mouth with a cool pillow of froth. It is quite refreshing but I found myself waiting for some bite or taste on the back end that never came. It had more zest than taste. It would be a good accompaniment as suggested on the bottle, for lighter fare. You get a small amount of the bitterness of the peel, and I can't help thinking with a bit of cinnamon, this might make a neat winter warmer. I'm not sure this ale does justice to 5 malts and 5 hops, as I really couldn't taste them. The hops was evident in the citrus, but that could have been the oranges. Just nice. The closet thing I could compare this ale to is a wheat beer of the Hoegaarden variety. Or a Keith's/Rickards White with a slice of orange in it. 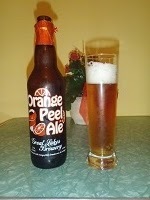 For all the malt and hops and orange peel and honey, there really wasn't much to it. It is a refreshing brew to be sure, well suited to the spring and summer months, but the complexity of taste and zest promised wasn't there. If I'm going to have a seasonal with oranges or some other additive, that component should be evident or well balanced with some bite or flavour, but here it was mostly absent. Otherwise I could just put an orange slice in a Grasshopper and be more satisfied. Overall this beer is nice, but it just doesn't follow through. So I'm giving it a C as I wouldn't recommend it over anything similar on a regular tap at the pub.